The rookie is changing the fate of the Eagles’ franchise. After Doug Pederson’s press conference ended Sunday night, reporters piled through the narrow passageway connecting the conference room to the Eagles’ locker room. A few hit a snag, and a backup developed. The team’s owner, Jeffrey Lurie, was making his way into the locker room. One intrepid reporter pressed the big red button on his digital recorder and asked Lurie what he thought of the way his team played. But Lurie, it turned out, didn’t trek to the belly of the stadium to talk to reporters. He wanted to talk to the man changing his life. Still shirtless, Carson Wentz stood at his locker, which is located near the corner at the opposite end of the showers. Lurie strode over to the new face of his franchise, gave him a handshake, and talked to the rookie one-on-one for just a few minutes. Wentz, 23 and towering over Lurie, smiled the earnest smile Eagles fans have quickly become acquainted with. Lurie, 65, beamed back up at him. I won’t pretend to know what they discussed, but it probably had something to do with the Eagles beating one of the best teams in the NFL. It also might have had something to do with the Eagles being one of the best teams in the NFL. It’s been 23 days since the Eagles traded Sam Bradford. It’s been 22 days since we learned Wentz would be the team’s starter. It’s been 15 days since the NFL season began. In less than a month, Wentz has altered not just his future, but the future of the entire franchise, by throwing five touchdowns, no interceptions, and every single throw he’s been asked to try. And everyone is taking notice. Everyone. To Jordan Matthews, a third-year wide receiver with a boundless optimism rivaling Wentz’s, the 3-0 start? The huge win over a Super Bowl contender? The half-dozen or so plays that make your jaw drop? He’s not surprised. Before Sunday’s game, Matthews was strolling through the team’s hotel lobby at 8:00 in the morning. He was getting breakfast. He passed Wentz in the lobby. Eight hours before he would take the field, Wentz was walking the other way, heading to study film. “On game day,” Matthews said, emphasizing Wentz’s preparation level. Come game day, most players feel you’re either ready or you’re not. You’ve spent your entire week preparing for this game. Film study on game day isn’t terribly common. When he was named the starter, of course, Wentz started coming to the Eagles’ practice facility at 5:30 AM to get extra study sessions in with Chase Daniel, mimicking Super Bowl champion Drew Brees. 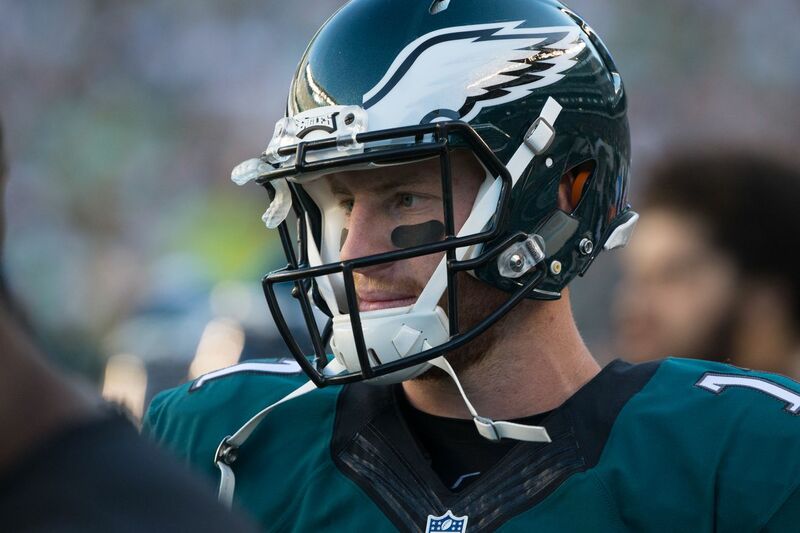 Before his first career start, Wentz was spotted sitting on the Eagles’ bench at Lincoln Financial Field with a tablet in his hands, swiping through film. He and the Eagles beat the Browns, 29-10, that afternoon. And this week, a story floated around the internet about Wentz studying film on a date with his girlfriend. With all the evidence, it seems pretty believable. Wentz’s plan seems simple: prepare until he can’t prepare anymore, and then go out and show how much work he put in. Malcolm Jenkins can’t believe what he’s watching. In his post-game press conference Sunday, Jenkins broke down what the defense did so well to limit Ben Roethlisberger and the Steelers to three points. But, as most do in Philadelphia these days, the conversation eventually swung to Carson Wentz. When Jenkins is sitting on the sideline, does he catch himself watching No. 11? Jenkins then shook his head ever so slightly, and said he thinks everyone is waiting for Wentz to fall off. Make a bad decision. Make one rookie mistake. Everyone? One reporter asked what Jenkins meant by everyone. Everyone on the outside? Or even people on the inside of the locker room? Carson Wentz has played such incredible football through three games that seasoned veterans on his own team are waiting for his downfall. That’s how unbelievable he’s been. So unbelievable, the guys he’s scoring for can’t help but wonder when they’ll be shaken awake. Jenkins is a measured man; when he speaks, he speaks with purpose. So when he called what Wentz is doing ‘something special,’ you can bet he meant it. When he said he was waiting for Wentz to fail, to show that he’s a fallible human being, you can bet he meant that, too. Of course, the question arose — what if that rookie moment never comes? What if Wentz is just this good, and he’s going to be this good for the Eagles for a very long time? “We’ll win a lot of games,” he said.